I am a firm believer in positive praise and reinforcement in order to encourage students to behave in an appropriate manner to allow us a rich learning environment. I do, however, recognize that we are still early learners and will not always be able to make right choices all of the time. These mistakes are, after all, how we learn to become better students. I have developed a management system for when compliments and praise just don't do it and further reminders are necessary. The behavior program is called "Keep in Shape" and its purpose is to encourage students to think about their behavior and strive for good choices. It is displayed on the front board and is set up similar to that of a traffic light. If a student does not react to positive reinforcement he/she will be asked to move a clothes pin with his/her number on it from a green circle which everyone begins the day on, to a yellow triangle as a reminder to stay on task. 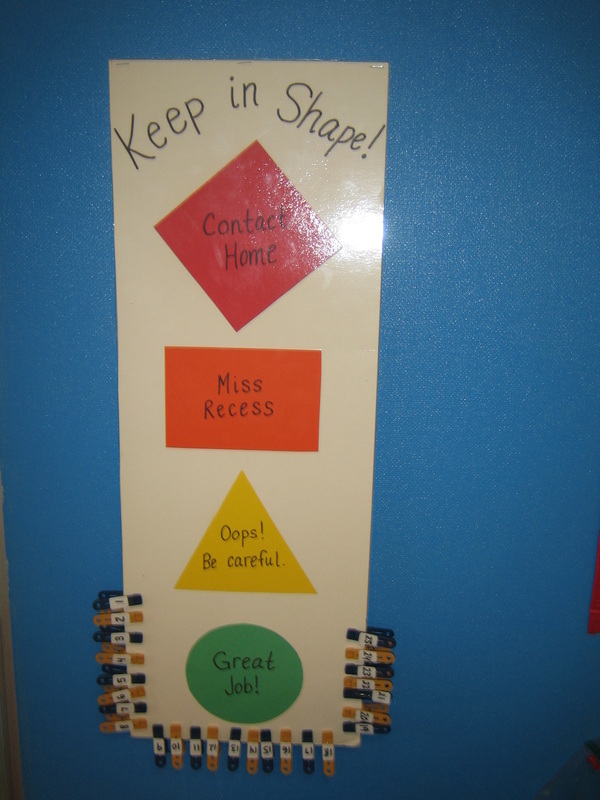 If the student fails to remember the importance of the reminder he/she will then be asked to move his/her clip to an orange rectangle at which point a portion or all of recess will be missed. At this point I feel after this many warnings are granted a student is disrupting the flow of learning not only for themselves but, also those around them. It is here that the student will move his/her clothes pin to a red diamond which will trigger a call home so that you and I, together, can work to get the student back on track in order for him/her to be getting the most out of his/her learning. We have a really GREAT group and I do not anticipate any problems however, I do not expect perfection and recognize that we all have our days!!! Hopefully the students will not have to have me move my pin on any given day. So, I remain positive and hope that we can all have a GREEN day most of the time. Please know that the students and I have discussed this program together and they are fully aware or their responsibilities and the consequences.